It’s ridiculous how mired up I am in this book. But I distinctly remember how awful I felt when the last one wasn’t going well and how amazing it was when the book finally opened up and yielded its secrets to me. I hear other people talk about how disappointed they are that the book they have in their minds doesn’t ever get translated onto the page. With me, the book in my mind feels weak and ephemeral until it finally materializes on the page. Anyway, I’m at that point in the writing process where I can’t bear to read fiction, so I’ve been scrounging around for good nonfiction to read, and I recently read a great one. Janet Malcolm’s The Journalist And The Murderer has what is (justly) one of the most famous opening paragraphs in nonfiction writing. Her book is a book that’s about another book: Joe McGinnis’ Fatal Vision. McGinnis was a well-known journalist who embedded himself within the defense team of a murder suspect, convinced the suspect that he believed the suspect to be innocent, became friends with the suspect, corresponded with him for four years (even after the suspect’s conviction), and then released a book that decried the murderer as a twisted, amoral narcissist who was definitely guilty of the murder. In response, the suspect sued McGinnis for fraud and came very close to winning his case (one determined juror hung the jury and saved McGinnis from losing the case. However, McGinnis subsequently settled and gave the suspect $330,000). 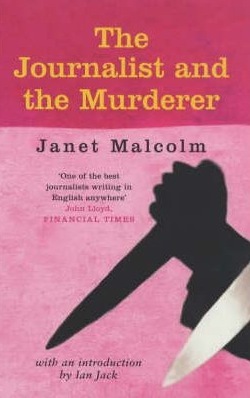 Malcolm’s book is analysis of what happened in that case and an exploration of what it means to be a journalist: what it means to convince people to talk to you, and then to put your own spin on their story. She also seems very interested in the psychology of the interview subject. She tries to elucidate what exactly the subject hopes to get out of the interview, and the reason why they talk to (and trust) the journalist even though they have no reason to. My only quibble with the book is that Malcolm gives the journalist too much credit. She portrays the journalist as a bloodthirsty conniver who says and does anything in order to get information out of the subject and then goes out and writes their own article. Whereas, actually, what we’ve seen in the modern era is that it’s actually not uncommon for interview subjects to co-opt the journalists who cover them. There’s a reason that celebrity journalists are so breathlessly appreciative of rock stars, and sports journalists build so much hype around sports stars, and business journalists are relentless in heaping praise upon successful CEOs. The journalist often seems himself as a relatively unimportant person. And, furthermore, a person who can be replaced by one of a hundred other equally hungry journalists. In many cases, the journalist understands, either consciously or unconsciously, that his purposes are more suited by hagiography than by a take-down. The spinelessness of most journalism is what neuters much of the impact of Malcolm’s book. However, it’s still worth reading. It’s a well-observed and astute book…it just doesn’t apply to nearly as great a percentage of journalist as she actually thinks it does. (Also fun about the book is the relentless navel-gazing. Malcolm is very aware that she is engaged in the same pursuit that McGinnis was involved in. And she consistently questions herself and her relationships with her own interview subjects).